Washington Post recently performed a social experiment inside of a DC Metro stop where they planted a world famous violinist to play during rush hour to see how many people would actually stop to “hear the music”. As you can see in the video below, very few people took the time to listen. That night, Joshua Bell sold out a concert hall at $100 per seat. I recently joined a gym in the neighbourhood, mostly due to it’s convenient location. Before making a 6 month contract commitment, I made sure to look at what others had to say online. 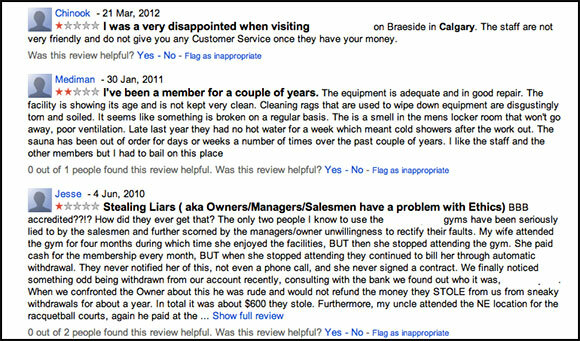 The last three Google Reviews for the place were less then flattering and you can see them below. After about a month of going there, I thought to stop by the owners office and see if they were even aware of these reviews and if they understood how much of an impact on new memberships they can have. It was a brief, distracted conversation where the owner mentioned it was the “crazies” posting and we parted ways with me offering essentially a free consultation to help them get a grasp on their online reputation and think about some ways to improve it. I left my name and number and left. It’s been a couple of weeks now and it’s obvious the call won’t happen, which got me thinking… what is the value of free advice? There is already an incredible amount of free advice posted every day on blogs, white papers, videos and so forth. However, the relevance and impact of it depends entirely on timing. It’s a classic case of prevention vs treatment. A leader may only be interested in reputation management after their company gets hit with a bad review gone viral. Only then can they put a context around the revenue impact such an event can have, and only then are they willing to allocate resources to it. But by that point in time, it’s already too late to solve the situation with a bandaid. That piece of free advice that showed up at your door, in your inbox, Twitter or Facebook feed is long gone and has now substantially increased in cost. As an effective leader, it’s tough to balance the overwhelming amount of incoming information vs the tried and true – but if your aim is to remain relevant, it’s important to dedicate time to plug in and listen. To your employees, to other leaders in the field, to bloggers, to podcasters, to trend watchers and so forth, so if nothing else your are at least aware of the changes that are reshaping your business environment on a daily basis. As an effective marketer, think about the content strategy you can wrap around the need trigger. As soon as it hits your target market, how are they going to look for help? What kind of format will be most helpful in the fastest way (video, article, contact form, landing page…)? How will your company show up a problem solver? This is the new battleground of relevance for marketers and it’s equally applicable to a plumber as much as it is to a tax firm.